This is part four of a five part series. If you haven’t yet done so, you may find it helpful to read parts one, two, and three of this series for context. 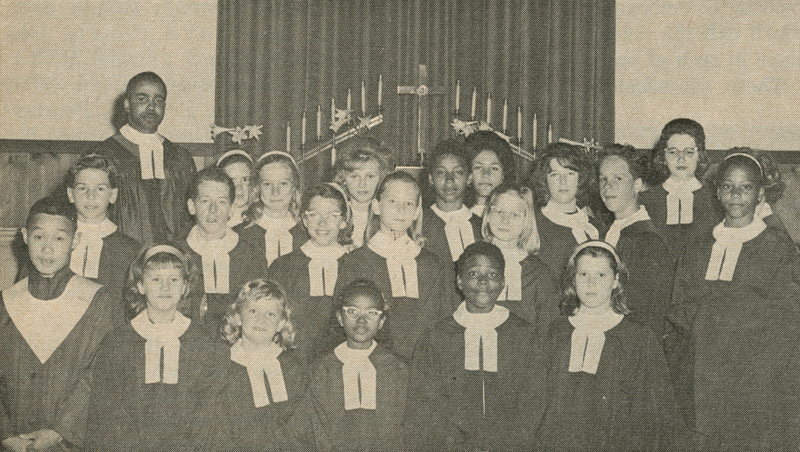 Today, we’ll look at the years 1968-69 in the Baptist General Conference. Those two years saw sustained, often violent protest in America’s campuses and cities – and indeed, across the world. Nineteen sixty-eight in particular, would be a watershed year in U.S. history, one which would see support for American involvement in Vietnam finally tip into disapproval. The year began with the Tet Offensive, a coordinated attack that took South Vietnamese and American forces completely by surprise. Although the offensive would be repelled, the public was shocked by television images of embattled U.S. troops retreating through the streets of Saigon. Then in March, U.S. troops massacred around four hundred Vietnamese civilians in a small hamlet called My Lai. When the killings became public in November 1969, they provoked widespread outrage. In March, president Johnson announced he would not seek reelection, saying that he wanted his successor could pursue a new path towards ending the war. In April, Martin Luther King Jr. was gunned down in Memphis, and in June, Robert Kennedy was slain in Los Angeles. Finally, August saw the Democratic National Convention in Chicago rent in two ways: first, by the splitting of the Democratic party into embittered pro- and anti-war factions inside the convention hall, and second, by scenes of police violence outside the premises. And that leaves aside the series of national protests against the war that followed in rapid succession in 1969. That pattern was typical of these two years; while the world burned, Conference Baptists retreated from debating the war. In its place, the Standard evinced a renewed and significantly intensified emphasis on evangelism at home and on missions abroad. 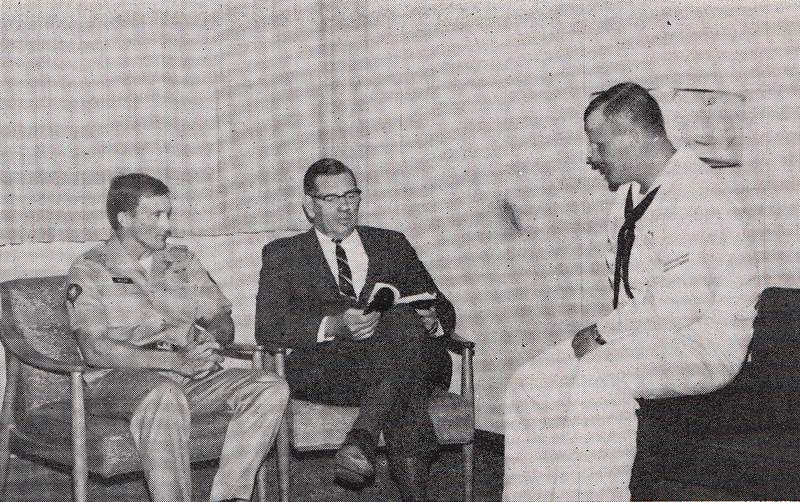 And as they did in 1965-67, Conference chaplains played a key role in mediating the war to domestic readers. 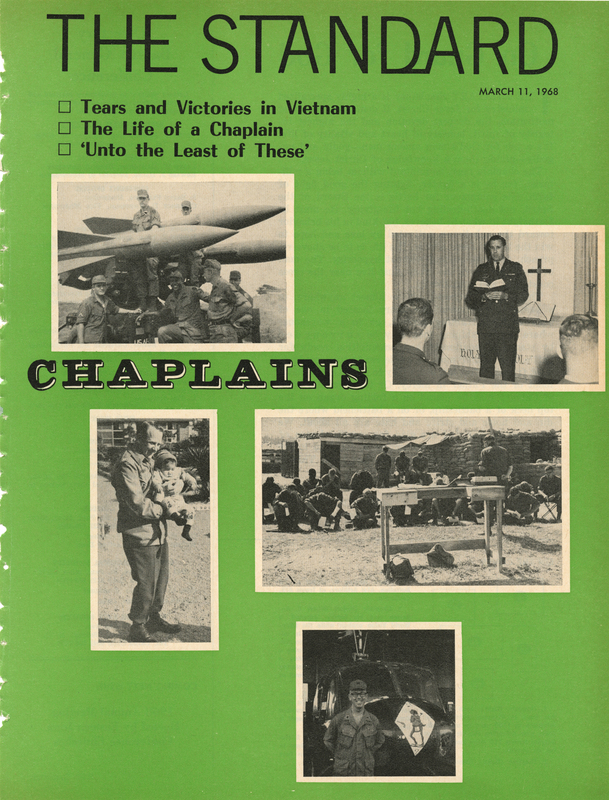 If anything, the coverage and plaudits heaped upon chaplains increased in ’68-69. Yet its decision to ignore the war also forced a change in how the Conference constructed the role of the chaplain. Whereas in previous years chaplains had been characterized more as missionaries than as part of the American military apparatus, the domestication of the chaplain intensified in 1968-69 as the language and imagery of the domestic church invaded the military chaplaincy. 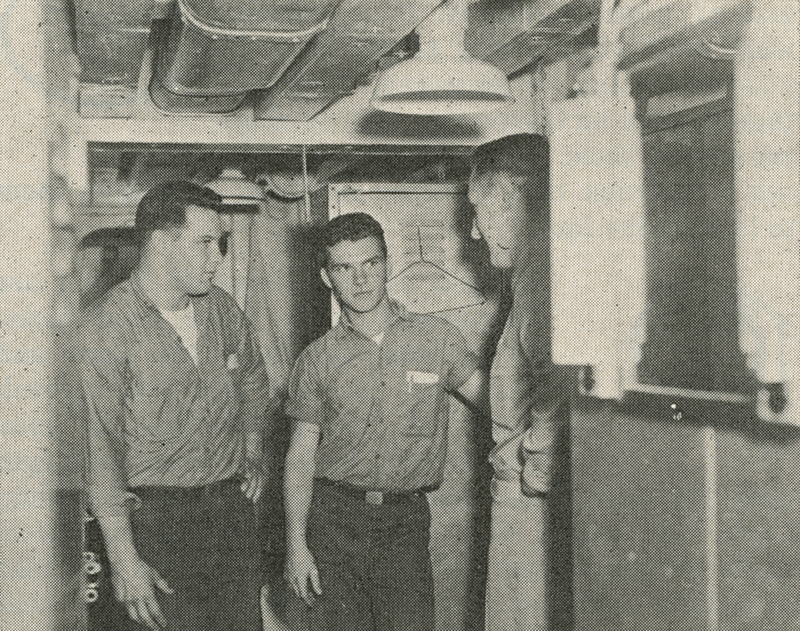 In early 1968, chaplains were still seen as warriors, not on a physical plane, but in the spiritual realm. In the special chaplain-themed March 11, 1968 Standard, newly-elected general secretary of the Conference Lloyd Dahlquist introduced the issue with an editorial on the role of the chaplain. Dahlquist characterized the chaplaincy as a “highly specialized ministry for Jesus Christ.” Writing “the chaplain must be militant without being a militarist, for he is a fighter, fighting the good fight of faith. His equipment for battle is the Sword of the Spirit, not death-dealing but life-giving,” Dahlquist continued the reasoning of earlier Conference figures who had seen chaplains as spiritual shock troops in the front lines against communism. But that kind of rhetoric began to change toward the end of the year. In what can only be characterized as an ‘invasion of the domestic,’ by the end of 1968, the chaplaincy had been recast in a very different light. 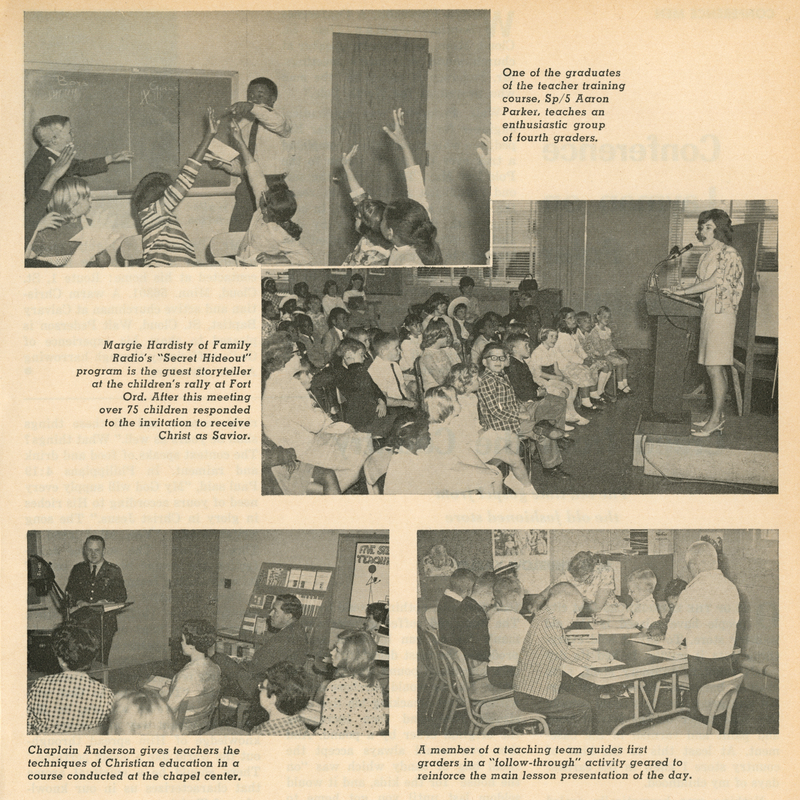 Instead of images of chaplains posing with tanks and artillery pieces, articles from the end of 1968 were illustrated with scenes redolent of the American neighborhood church. While coverage of chaplains’ work in Vietnam continued apace, more emphasis was given to the work of the stateside chaplains who were stationed at Air Force bases and military and chaplaincy schools. It’s not fair to suggest that the armed forced were no longer seen as essentially military in nature; more accurately, the way the Conference understood the military was increasingly filtered through the issues that animated domestic Conference life – primarily a renewed emphasis on evangelism and church building (we’ll discuss this in detail later). 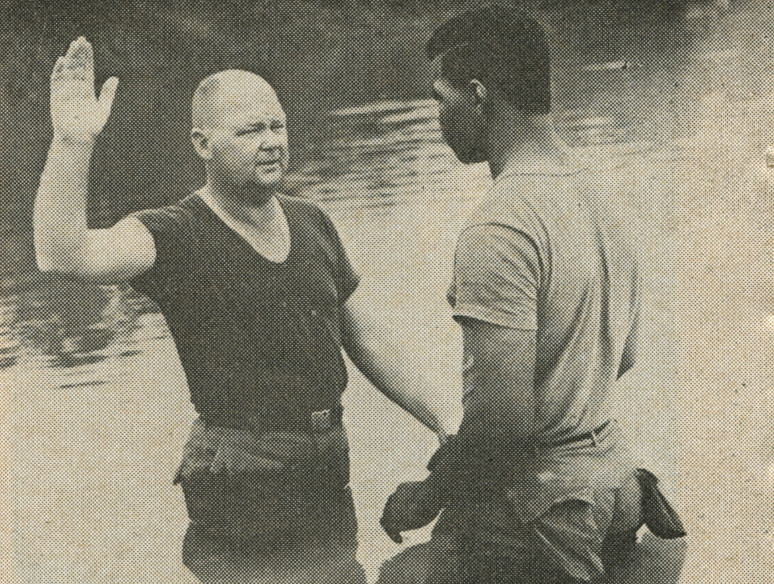 A September 23, 1968 feature on Conference chaplain Robert Anderson demonstrates how military subjects began to look more like domestic Sunday School features. 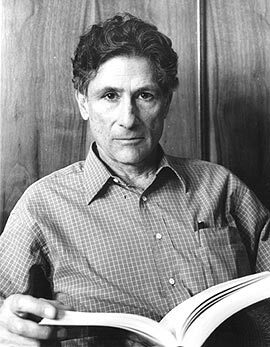 Anderson was stationed at Fort Ord, a military base located in central California. Anderson’s responsibilities included organizing the adult Christian Education and child Sunday School programs on the Fort. The piece was liberally illustrated with pictures that, aside from the occasional uniformed teacher, could be drawn from the history of any mid-century, suburban protestant church. And there are other examples too: a January 27, 1969 article treated cadets at the Air Force Academy in Colorado Springs much like civilian college students at Bethel College; a June 2, 1969 piece profiled a chaplain stationed at an Appalachian training camp for cooks, clerks, mechanics, and radio operators; and a December 1, 1969 article covered a group of Conference chaplains stationed at the United States Army Chaplain School — all articles that focus on the domestic and the commonplace in contrast to the exotic and oriental (this would be a good place to put the BGC’s depictions and language of Vietnam as Other in dialogue with ideas from Edward Said’s classic book, Orientalism — perhaps a post for another time). The central problems that the articles focus on — evangelism, program-building, and the ever-difficult to describe concern with the ‘advance of the denomination’s mission’ — are exactly the kinds of issues the Standard increasingly focused on in the civilian sphere of life. While his last sentence previews something I’ll pick up on towards the end of this post, I want to focus for now on another of Bogaski’s ideas. Writing of conservative evangelicals who viewed winning in Vietnam as a geopolitical necessity, Bogaski concludes that “faced with a war gone awry… these churchmen quieted their speech … They replaced the positive descriptions of soldiers with negative ones which focused entirely on their spirituality.” That quietism is something we’ve already seen in the BGC — at least when it came to debating the merits of the war. At this point, I’m more interested in Bogaski’s conclusion that some denominations’ descriptions of American soldiers shifted in response to the floundering war effort. And while the BGC was never quite as effusive in praise of the military as, for example, the Southern Baptist Bogaski studied, I think the evidence suggests that the BGC too, shifted its assessment of the U.S. military. “make sure you know yourselves and your standards before you come into the service. Life is no “sweat” if you have already determined your moral values. But if you go into the service with a vacuum you will be sucked down the tubes!” (Chaplain John H. Reed, May 20, 1968 Standard). I don’t think it’s coincidental that as the Conference moved toward a more negative assessment of the moral aspects of military life, Standard editors urged the adoption of new forms of liturgy for servicemen. Termed a “Commissioning Service,” the first appearance of this new liturgy was in July 1966, when Gunnar Hoglund wrote up the suggestions of a Conference chaplain. While Hoglund revealed the reasoning behind the service was that American G.I.s were just as much missionaries as civilians, some of the language of the liturgy prefaces the linguistic shift that was completed by 1968. One of the questions the officiant was to pose to young men entering the service was “as a sacred trust will you do your best to maintain a warm and strong spiritual life?” The response? “I will” (Standard July 4, 1966). That same ceremony was reiterated in December of 1967. 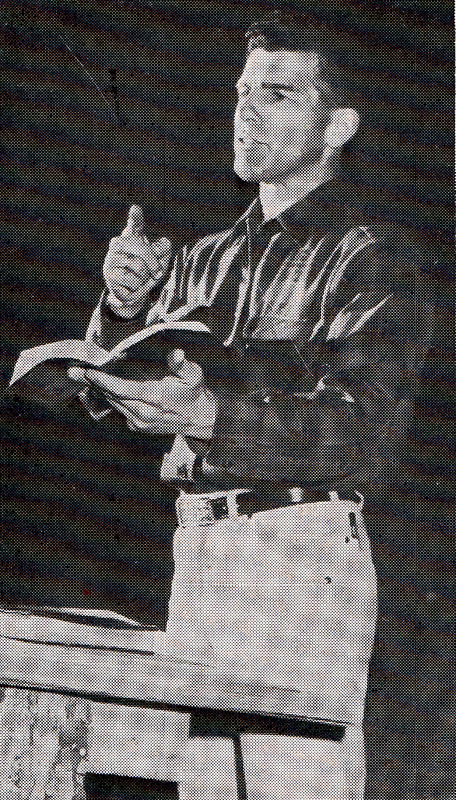 By 1968, among the suggestions a Conference author had for pastors of departing servicemen were to: “Be specific regarding the facts of life and the temptations they will face in the military’s anonymous society,” and to “Present them with reading and devotional material that will strengthen their spiritual lives” (Standard, March 11, 1968). Pastors in the Conference thus sought to inoculate their men against the temptations that would await them in the services. With the war going poorly, a military full of “the lost,” and domestic unrest and violence near the breaking point — at least in the BGC’s estimation — it makes perfect sense that the Conference would react to the domestic and the military with the exact same prescription: missions, evangelism, and the expansion and development of the denominational apparatus — especially churches and Christian education programs. That tone — equal parts ebullient and trenchant — appears with renewed vigor in 1968-69. Certainly, the conference had been focused on missions and evangelism in the prior years, but the level of intensity with which the Conference pursued its mandate to save the lost is somewhat startling. A fairly representative table of contents from the November 4, 1968 Standard shows seven feature articles. With titles like “Why MISSION:ETHIOPIA?,” “Qualities Related to Effective Missionary Service,” “Don’t Overlook Missionary Education in Your Christian Education Program,” and “Ways to Make Youth Week Great,” five of them are explicitly concerned with evangelism. The answer to the endless suffering in Southeast Asia was exactly the same: “you can be sure that you are a Christian!” And the couriers for that message were the same as they had been in 1964-1967: chaplains. 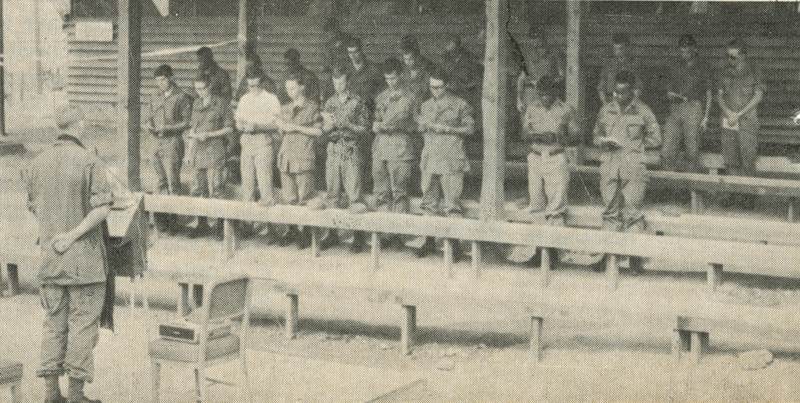 The chaplaincy continued to function as missionaries to both Vietnamese and servicemen in 1968-69, as they had in earlier years. Because I have argued above that the military was domesticated during this period, it may seem contradictory to also see a continued and highly visible role for military chaplains. I don’t think that sort of reasoning is helpful here, for two reasons. First, as I’ve already mentioned, the kinds of chaplain activities the Standard covered shifted from the battlefield in Vietnam to the Sunday School classroom on military bases in Colorado and the Ozarks. And second, as the Conference increasingly viewed the military as a fruitful missions field full of ‘the lost’ and concomitantly renewed its domestic evangelism, I see the continuing coverage of the missionary activities of military chaplains as less related to the Vietnam War than to the Conference’s concern for domestic issues. I wonder, given the rather exultant tone of Bradley’s (et al) article, whether the missionary role of chaplains was broadly recognized among the laity of the Conference. Its here that the weaknesses of using a source like the Standard are most manifest — the magazine was, after all, controlled by a small group of the Conference leadership. While I’ve found no evidence of reader letters contesting the role of the chaplain as laid out by the Standard, that hardly proves the role was accepted. And I do find it somewhat puzzling why so many self-justificatory pieces by chaplains were printed in the Standard. We begin with a summary of general Christian beliefs … I am continually amazed at how little churchgoing Protestants know about the Bible and so we have to lay some sort of basic groundwork. We then become quite specific and focus attention on the person of Jesus Christ, using the great film The Power of the Resurrection. 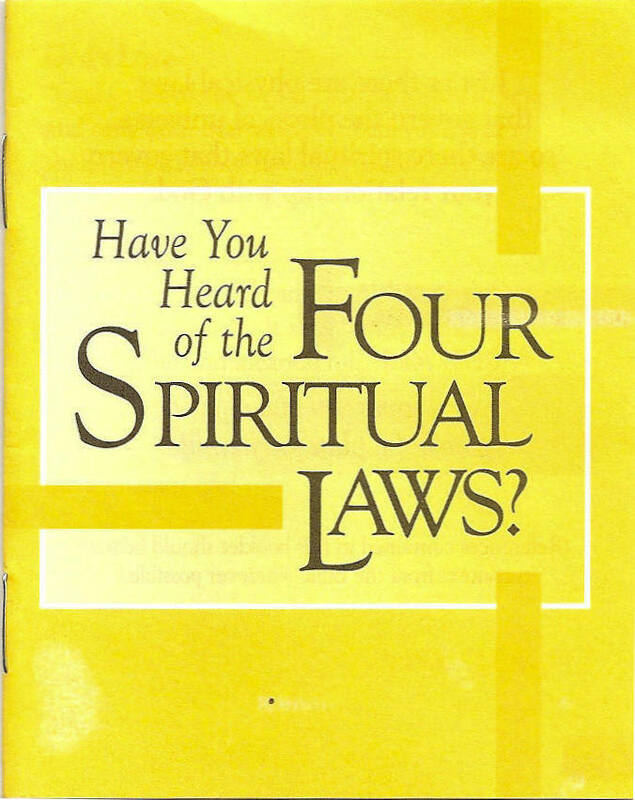 … This is followed up with a presentation of Campus Crusade’s “Four Spiritual Laws,” concluding with a decision appeal. Only the Lord knows how many men make genuine decisions for Christ, but we know that at least these men attending the retreat now know how to become his followers. For those familiar with contemporary evangelical culture, particularly its conservative expressions, Fernlund’s method should seem familiar, if slightly dated. 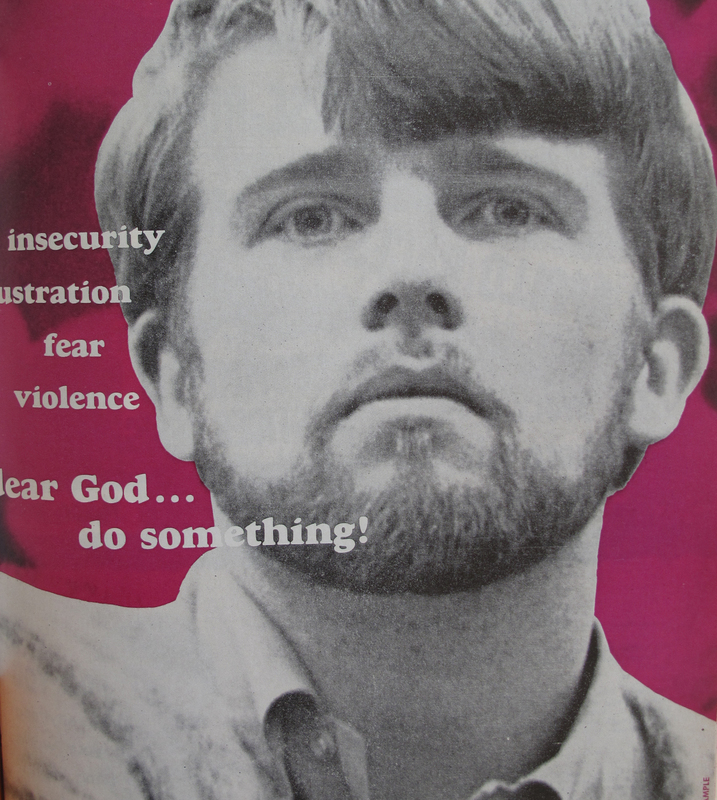 The use of a multimedia presentation, of film, and of Campus Crusade materials suggests a familial relation between the BGC of 1969 and the conservative American evangelicalism of the past several decades. I don’t think that’s a coincidence. And in spite of my earlier care to distinguish where the BGC of the ’60s was strikingly different from modern evangelicalism, as this series has moved forward in time, those differences have noticeably lessened. Besides his charming olfactory objection to the hippies, the tone of Hoglund’s critiques mirrors that offered by Sword of the Lord contributor and fundamentalist Tom Anderson, who began an invective against nonconformists so: “Dear spoiled, deluded, arrogant, brainwashed brats and know-it-alls: I am sick of you” (Pratt, 221). 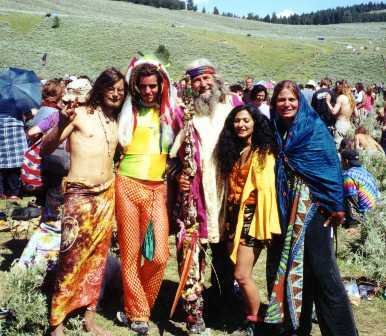 And while I haven’t taken the time to closely examine broader evangelical reaction to hippies, I suspect that both Hoglund and Anderson’s were fairly typical (if colourful) objections. We decided that what God wanted us to do was to open a gospel night club or an every night church. I don’t know what it is, except to call it His Place. … We have free coffee, free Kool-Aid … We are open every night of the week. We are open during the daytime for counseling … Every night there are from three to thirty who give their lives to Christ. During the past ten months there have been 2,600 young people and adults that have been saved in His Place on the Strip. 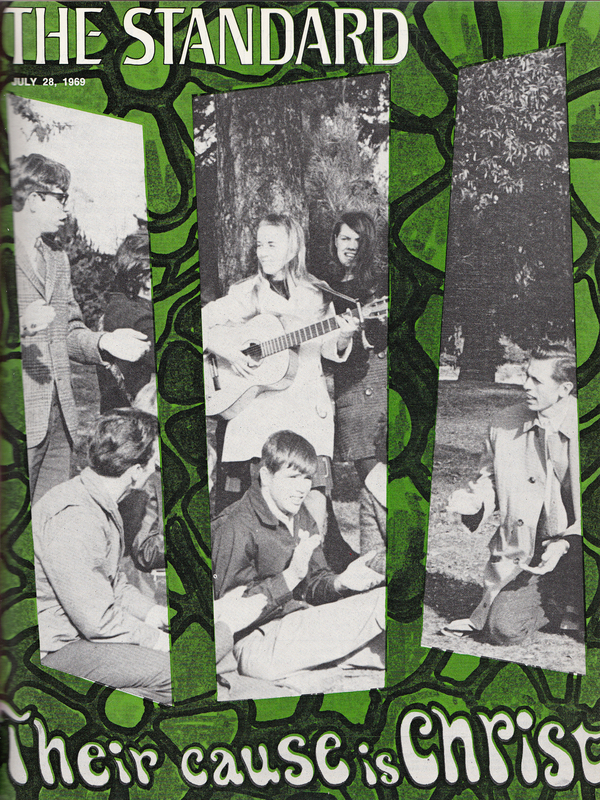 While I suspect that Conference leaders like Gunnar Hoglund still would have disapproved of the hippie movement, the use of recognizably hippie-themed iconography in the Standard suggests that Conference leaders were willing to appropriate the movement as an evangelistic tool. At the end of the year, protest language too, was used to lightly introduce an article on effective Christian Education teaching methods: “Do You Have a “Student Revolt” Against Ineffective Teaching?” (Standard, December 2, 1968). 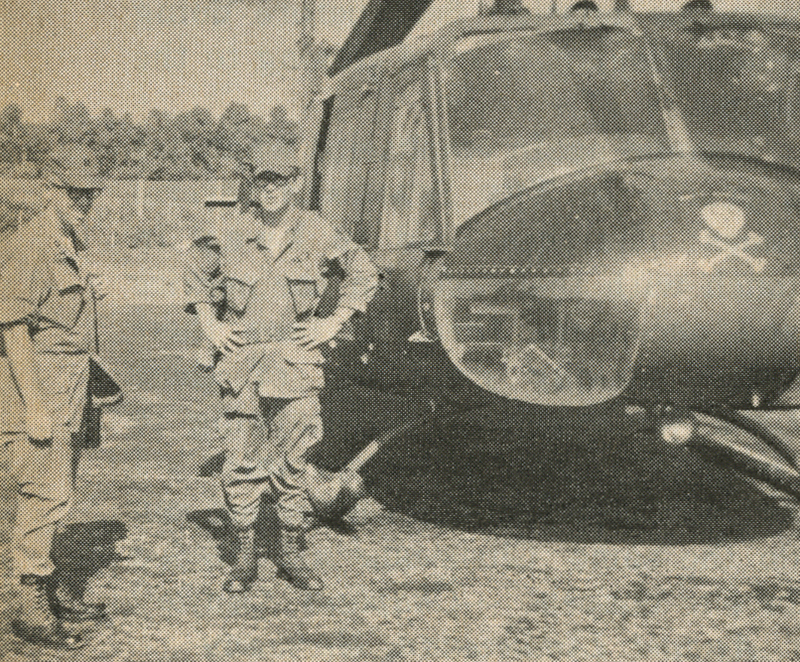 In the next (and last) post of this series, I’ll wrap up how the BGC responded to Vietnam. And I’ll also double-back to pick up on the trend I hinted at in the post — the emergence of a new-found concern for social issues such as marriage and divorce, abortion, science and faith, and biblical inerrancy; in short, the calling cards of the coming Moral Majority. “While it’s true that the BGC never saw the military as an unalloyed force for good…. The military was now a dangerous place for the Christian faithful, full of temptations and populated by drug users and the promiscuous.” This dovetails with a theme that kept popping up last week in my own research, Fletcher. I’ll write about it later this week. Very interesting read. Always glad to have the perspective of another denomination in the discussion. Thanks for reading, and for the comment, George. As I hope the posts indicate, I found your book very helpful to my research. It’s a valuable contribution to the literature. ← Christians at War: Pacifism or Isolationism?